Our priests devote their lives to bringing people closer to Christ, and in retirement, our priests continue to serve as spiritual leaders, counselors, ministers to the sick and much more. With gratitude for their years of faithful ministry, the Diocese has a Priests’ Pension Plan to support our 54 currently retired priests and those that will retire in the future. Rev. William Schuessler has served our Diocese for more than 47 years. He continues to do so by assisting the pastors in celebrating the sacraments in parishes, and conducting retreats during his retirement. 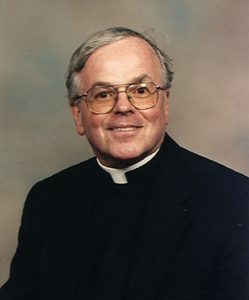 We thank you, Fr. Schuessler, and all our priests for your continued faithful service in retirement.